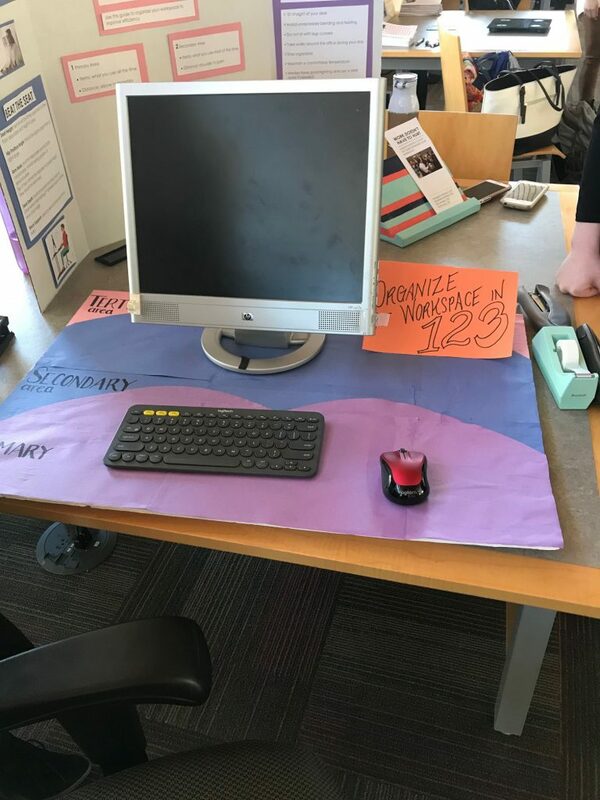 Students in the Southampton cohort of the Occupational Therapy program held a Health & Wellness Fair in the library this week. They put on a great show, providing a number of visually impressive and interactive displays on a variety of topics. I stopped to speak with each group and was struck by a number of things: 1) they really know their stuff, 2) OT touches on so many aspects of living that I never considered, and 3) OT has some interesting implications for libraries. Let me walk you through some of the displays from the Fair and share with you what I learned. In talking with the groups, we tried to apply the topic to the library environment. The information below comes out of our discussions and from the displays. I will preface this by saying that I am not an occupational therapist so any errors in interpretation or data are my own. 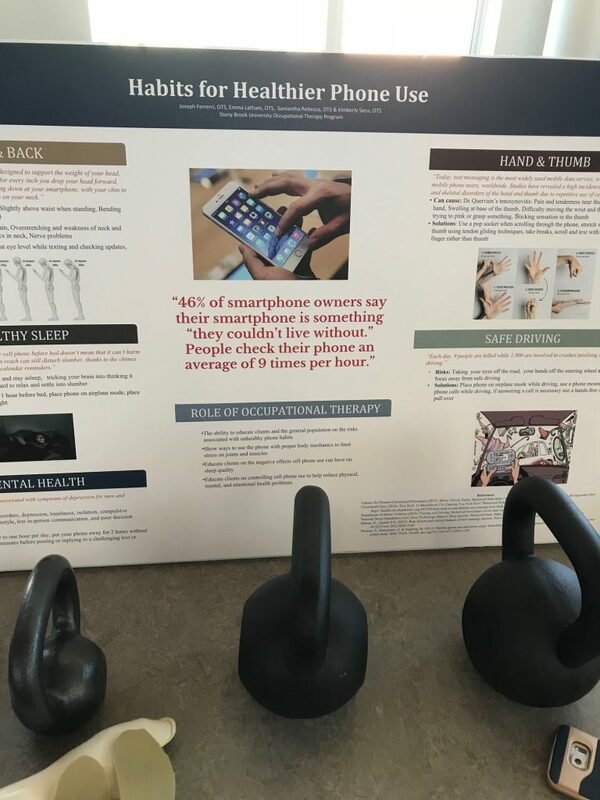 Habits for Healthier Phone Use by Joseph Ferreri, Emma Latham, Samantha Rebecca, Kimberly Siess. The weights you see relate to the amount of weight you feel as you look down at your phone/mobile device, which puts pressure on your upper back and neck. Excessive phone use can also effect your sleep, mental health (e.g., increasing self-isolation), and driving. Astonishingly, for every five seconds you take your eyes off the road to look at your phone, you travel the length of a football field. This display also supplied my favorite factoid of the day: the same injury now known as texting thumb was once commonly known as washerwoman’s sprain. Different century, same problem. Library takeaways: to help avoid distraction, should libraries provide lockers to secure phones during high study times? Would students benefit from locking away their devices for 2-3 hours of uninterrupted study? Diss-Stress by Anthony Kiriakos, Zachary Malone, Karissa Scialpi, Krystal Scott. Stress is present in all parts of our lives and no more so in the pursuit of upper-level academic degrees. Getting enough sleep and eating healthy are good preventative measures but so too are keeping a daily journal and sticking to a schedule. I also learned the 4As for dealing with particular stressors: try to Avoid it, Alter it, Adapt it, or Accept it. Library takeaways: we try to make the library as stress-free as possible. (Looking at you, Jesse.) One thing we discussed is having more “time-out” activities in the library: more games and things like knitting, crafts, etc. 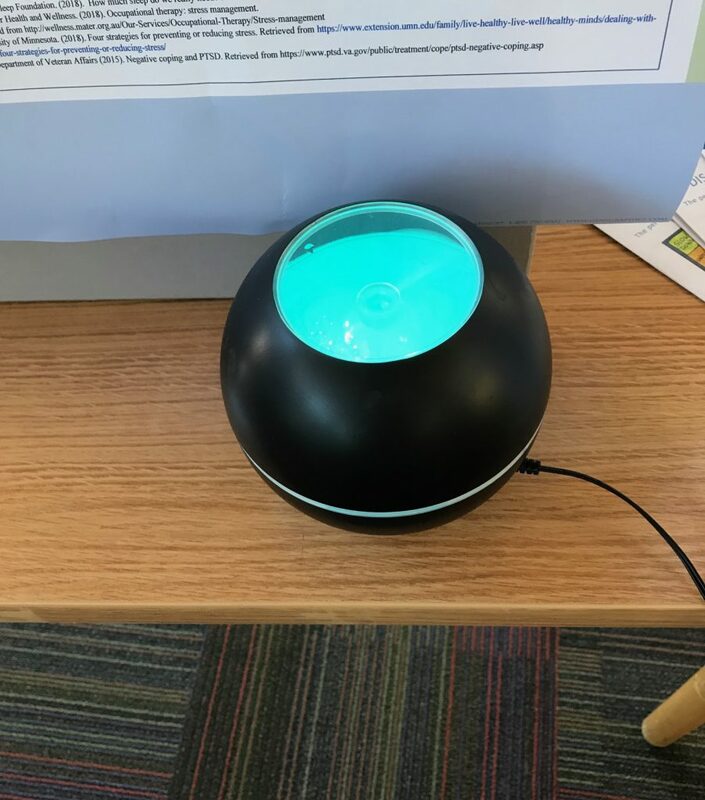 I’m also thinking we could equip our study rooms with white noise machines, maybe even circulate aroma therapy kits? And then, of course, there’s the nap room idea. Work Doesn’t Have to Hurt by Meagan Hallahan, Danielle Hamilton, Erin Hanley, Emily May. What is a library but one big workplace? So knowing how to optimize its various functions is key. We spend so much time sitting at desks and computers that it’s hard to see the incremental effects of bad habits or poor posture. I compared our computer stations and chairs to this team’s tips and we seemed to come out OK. You want your monitor 25 inches away from you, armrests and seat heights should be adjustable, and screens should be perpendicular to windows, parallel to light sources. Other strategies to keeping your space pain-free include staying organized, taking breaks to walk around, and keeping the temperature comfortable. Library takeaways: we’re rethinking some of our seating that’s currently looking straight out a window. We also talked about standing desks, something many of our Physical Therapy faculty have adopted. Perhaps we could circulate standing desk units, allowing students to set up at any location with a table top. Those are my library-related thoughts at the moment but there was even more to absorb from the Fair. For example, I ran home and weighed my children’s backpacks. You don’t want the packs to weigh more than 10% of the child’s weight. (We passed the test.) So again, great job by our OT students. If you’re at all interested, we have the brochures from the displays in the library. ‹ Literary Karaoke in Honor of Women’s History Month — March 21st!